With his signature evocative and rhyming text, writer and cartoonist Dr. Seuss, an American treasure whose books have delighted generations of young people, opens one of his most beloved tales, Horton Hears a Who! 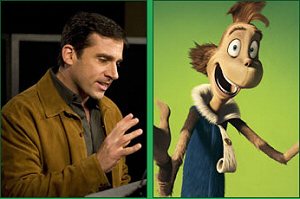 Now, over fifty years since Seuss, whose real name was Theodor Seuss Geisel, published this perennial favorite, the makers of ICE AGE and comedy giants Jim Carrey and Steve Carell, bring it to life in a way never before experienced. For the first time, a motion picture transports audiences into Dr. Seuss� incredible imagination, through stateof-the-art CG animation. 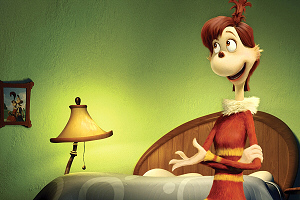 DR. SEUSS� HORTON HEARS A WHO! � is Seuss as you want to experience his work at the movies � and as it was meant to be seen. Then there�s Horton�s code�his motto� that, �an elephant�s faithful 100 percent� � pointing to his honesty and determination to never abandon his mission to find a new home for the speck that houses the incredible world of Who-ville. These philosophical declarations point to Seuss� unique ability to take complex issues and boil them down into understandable thoughts that anybody, at any age, could understand. It all comes together through the vision of a master storyteller, the magic of computer animation, and the special alchemy of three generations of comedy stars � Carrey and Carell are joined by the legendary Carol Burnett, as well as cutting-edge talents Will Arnett, Isla Fisher, Amy Poehler , Seth Rogen and Jonah Hill � to create an all-audience comedy event. Audrey Geisel wanted to make sure that the film adaptation be respectful of her late husband�s book. Meledandri assuaged her concerns, pointing out to her the considerable merits of CG animation and the proven successes of Blue Sky Studios, whose �Ice Age� and �Ice Age: The Meltdown� created fantastical characters; and whose �Robots� depicted a fantastical world. The films� artistry enveloped audiences in their environments and characters, suspending disbelief that they weren�t �real.� That same magic, Meledandri told Audrey, would do the same for DR. SEUSS� HORTON HEARS A WHO! To help close the deal, Meledandri asked Mike De Feo, head of Blue Sky�s sculpting department, to sculpt a pivotal scene from the book, in which the Mayor holds his son Jo-Jo above his head. As it turned out, the scene was one of Audrey�s favorites, and she loved the sculpture. Some time later, development commenced on the first CG animated feature film based on a work by Dr. Seuss. Horton, the Mayor, Jo-Jo, the Kangaroo � and all the beloved characters in the jungle of Nool and in the city of Whoville � were on their way to movie stardom. To guide their journey, the studio tapped Jimmy Hayward and Steve Martino to direct. They were a perfectly matched duo to bring Horton to digital life. 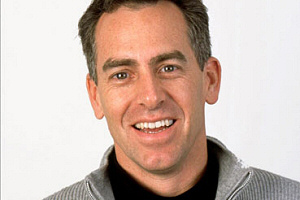 Hayward was an animator on the groundbreaking Pixar films �Toy Story,� �Toy Story 2,� �A Bug�s Life,� �Monsters Inc.� and �Finding Nemo�; and a story consultant and director of additional scenes on �Robots.� Martino, as art director on �Robots,� helped create the first animated feature that presented a totally imagined world � a wondrously clanky universe populated solely by mechanical beings. Hayward and Martino�s mandate was to stay true to Seuss� themes, characters and visuals. They based much of the look on Seuss art taken directly from the book, while other designs in the film are extrapolated from the author�s drawings or notes. Additionally, the filmmakers strove to push the medium of CG animation as far as possible, mixing old and new techniques to provide a look never before experienced in a motion picture, yet reminiscent of the era � the 1950s � the book was published. �We pushed everything, creating weird, fun Seussian colors and shapes, but with real textures,� says Hayward. 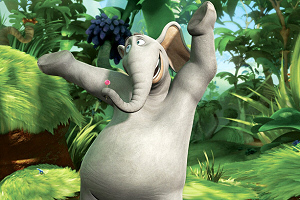 Horton is not like any elephant we�ve seen before. He is bigger than life in many ways beyond bulk; he has a big heart, big personality, and a big sense of fun. 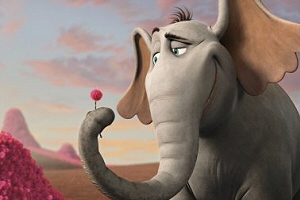 Horton shines through kindness, trustworthiness and perseverance. Despite formidable adversity, ridicule, condemnation and threats, Horton�s resolve to bring Who-ville to safety, remains steadfast. He�s always faithful�100 percent. 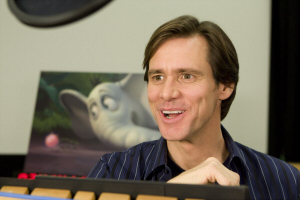 According to the filmmakers, Jim Carrey brings far more than his superstar comedy talents to the role of Horton. �Jim has a warmth and humor that�s amazing, and which kept Horton that sweet, lovable character we know from the books,� says Jimmy Hayward. �He�s a passionate, creative force and really owned the character. 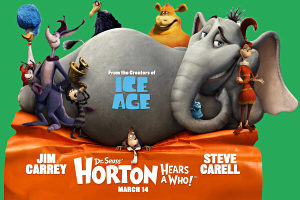 Horton�s chief relationship in the story is with the Mayor of Who-ville, whom Horton never sees, and who cannot see him. Yet the bond they form is a remarkable one, rich with warmth, friendship and humor, even though the stakes for both are life and death. As Horton makes his epic journey to bring Who-ville to safety, the Mayor � the voice of all the Whos � risks everything to convince his constituents of the dangers ahead. Dr. Seuss so memorably introduces the Mayor as ��devoted and fair, and a little bit odd. The Mayor and his wife, they had children to spare.� And how! They are proud parents to 96 daughters and one son. The endless parade of offspring is introduced sitting on chairs attached to a conveyer belt that rotates around the table, so that each has a brief but impactful audience with the Mayor; it�s an imaginatively patterned procession reminiscent of a scene from a Busby Berkeley musical. 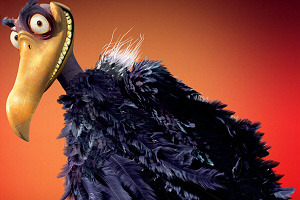 The chief threat to Horton�s quest � and in turn to the survival of Who-ville � is the Kangaroo, who, as the film tells us, �made every law and enforced every rule, as selfproclaimed head of the jungle of Nool.� She has a sour disposition and a closed mind, insisting that �if you can�t see something, it doesn�t exist.� Kangaroo�s closed-in philosophy has potentially grave consequences for Horton, the Mayor, and all of Whoville. Returning to the subject of Kangaroo�s alleged villainy, Burnett points out that �when playing a villain, you don�t see the character as villainous. A villain doesn�t think he or she is evil. They see the good � that they�re righteous in their feelings and thoughts. And if everybody else would just listen to and agree with them, the world will be just wonderful. Will Arnett (�Arrested Development�), who plays Vlad, says the character is �his own breed of bird � a dangerous guy�a gun for hire. He�s pseudo-hip � woefully behind the times. But he thinks he�s on top of the latest in pop culture. �Saturday Night Live� mainstay Amy Poehler, the real-life wife to Vlad Vlad-IKoff himself � Will Arnett � makes the character an engaging character that calls her husband on his frantic behavior, but always doing so with understanding and a sense of humor. �Amy makes the character contemporary and real, but with a tongue-in-cheek bite,� says Martino. Determined to stay true to the vision and magic of Dr. Seuss� environments and characters while translating his pen and ink style into a fully dimensional world, Jimmy Hayward and Steve Martino visited the Geisel Library at the University of California San Diego, which houses all of his original work. Searching for clues to Seussian design, the filmmakers studied the author�s original art and read every manuscript, even his handwritten notes and annotations. 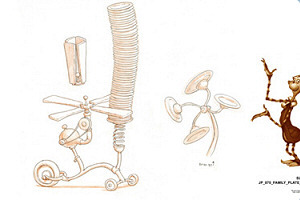 Says Steve Martino: �I was particularly taken by some sculptures Seuss had done, which provided direction on how he would have translated his ideas and world into three dimensions. We found some subtle references to color, shape and texture that would incorporate into the film. From the Seuss works he and Hayward painstakingly studied at the archives, Martino created a style guide that provided a foundation from which the filmmakers created a fully dimensional, textured and realistically lit world. �We could take a camera through the 3-D world we were building and explore it in great depth,� notes Martino. Seuss enjoyed surprising people with little details and off-kilter designs. The key to success in translating his work to the world of computer animation was making these details and designs fun and relatable. The filmmakers called their approach �Seussian logic� � a process that ensured every crazy gizmo and contraption was entertainingly correct. If a sock-mobile or bed-mobile sound too conventional for you, then you might want to try Jo-Jo�s giant sling-shot device, which he uses to access an old observatory that figures prominently in the story. First, Jo-Jo sits down on a unicycle connected to the contraption, then he pedals back the unicycle, looking like he�s about to launch himself into a wall, grabs and pulls back on a lever, firing himself straight up in the air, to a hanging stairway. Even when Hayward, Martino and their teams came up with original designs, they wanted audiences to feel like they were experiencing something from a Seussian world �We worked to find an authenticity that fit into people�s memories of Seuss� book,� explains Martino. Seuss� Whos, for example, were bug-like with round heads. To make the characters more expressive, the filmmakers re-imagined the characters, giving them more facial mobility and brow movement. The filmmakers built upon the minimalist Nool conceived by Seuss, who in his book, says art director Thomas Cardone, �left huge white spaces for text and some artwork. So we really didn�t start with a Seuss jungle because he didn�t create one.� The movie�s Nool is like no jungle we�ve seen before, rich with enormous swirling fronds, billowing blue bushes and towering palm trees topped with hair-like tufts. In Who-ville, fur is more than a fine coat of hair covering the skin � it�s a fashion statement. All the clothing in the tiny town is made of fur. The underlying geometry of a Who is what the Blue Sky fur team called a �peanut� � a naked Who under a suit, jacket, shirt, or dress of fur. The result is a very stylized fur look. The fur-as-fashion notion comes straight from Dr. Seuss. 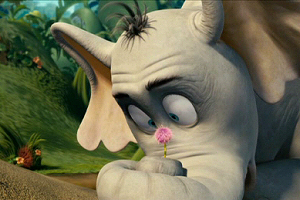 �He had great renderings of fur in his books,� says Hayward, who points to a personal favorite dating back to the director�s childhood: �I remembered this one drawing in the book [Horton Hears a Who!] where there�s a Who wearing a fur shirt. I became obsessed with that character, maybe because my name is Hayward and the guy�s shirt has an �H� on it,� he adds, with a laugh. Everything from haute couture to functional garb is the product of a Who-ville barber � and Blue Sky Studios� innovative fur and grooming teams. The fur and other unique visuals are a product of Blue Sky�s proprietary technology, the cornerstone of which is its ray tracing renderer, CGI Studio. The renderer, the fastest and most advanced of its type, allowed the filmmakers to manipulate the fur and environments, as if they were working with real lights on a real set, working with materials that behaved the way they do in the �real� world. It renders surfaces as if you could touch them. The renderer made possible the film�s huge crowd and mob scenes, featuring thousand of furry characters. But it was much more than fur and fashion for the film�s innovative R&D team, which also created a field of one-half-billion clovers for a pivotal scene. Vlad, after snatching the clover, on which rests the speck/Who-ville, out of Horton�s trunk, drops the precious flower into a field of about five hundred million � onehalf-billion�clovers stretching as far as the eye can see. One by one, Horton examines the clovers, carving his way through the immense field. It�s the ultimate �needle-in-ahaystack� scenario. The �hero� clover � the one housing Who-ville � was made up of a million hairs. For the clover field scene, the clovers closest to the camera had the full hair count or close to it; the �extra� or �supporting� closers averaged 50,000 hairs. Endeavoring to fully capture the wondrous and wildly imaginative worlds of Dr. Seuss, the filmmakers push the animation and rigging beyond the traditional boundaries of animation physics and character performance and believability. 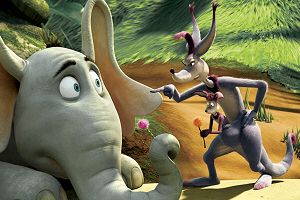 They employ �squash-and-stretch� techniques to push Horton and the Mayor to extreme looks and movements. In traditional 2-D animation, squash-and-stretch gives characters elasticity and movement. But Hayward, Martino and the Blue Sky artists, animators and technicians take the technique to a new level. 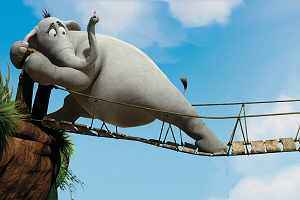 Perhaps no scene better demonstrates the effectiveness of their squash-and-stretch techniques than when Horton � clover in tow � attempts to cross a long, rickety bamboo bridge overhanging on a deep gorge. At the same time, the Mayor is visiting the dentist, who is about to use a giant hypodermic needle on the Mayor. Hayward and Martino intercut the two hyper-precarious situations, creating an intricately constructed scene of cause-and-effect. Every Horton action (or stumble) has an equal (or equally crazy) reaction on the Mayor. 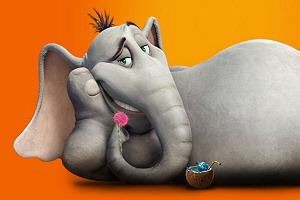 In the sequence, the filmmakers employ squash-and-stretch to inflate Horton�s trunk � the ten-thousand-pound elephant (and eternal optimist), thinking air to be �lighter� than anything, believes he can float across the bridge like a dirigible. Needless to say, Horton�s expectations aren�t quite fulfilled. As Horton, inflated trunk and all, continues to stumble, leaving broken pieces of the bridge behind every step, the dentist�s hypodermic ends up in the Mayor�s arm instead of his mouth. The filmmakers again seize the opportunity to push the animation, stretching the mayor�s injected arm 30-feetlong. As the Mayor flees the office, his newly-elongated and flaccid limb accidentally smacks a few people across the face. The animators also used squash-and-stretch for a �smear� effect, where, for example, a character�s legs move so quickly, they begin to smear � and look like they�re doubling or tripling in number. Sound and music come together in Dr. Seuss' Horton Hears a Who! The film�s intricate and at times majestic marriage of sound design and music stems from the talents of two-time Oscar� winning sound designer Randy Thom (�The Incredibles,� �The Right Stuff�), who has also worked on films ranging from �Raiders of the Lost Ark� to �Ratatouille�; and composer John Powell, whose credits include �Shrek,� �Happy Feet,� �Ice Age: The Meltdown� � and the three �Bourne� films. Thom endeavored to open the audiences� ears to different perceptions of sounds � suspending disbelief that a microscopic man and a five-ton elephant could actually hear one another. The first contact between Horton and the Mayor involves complex sound transitions: As the speck flies through the air, we see the adrift Whos yelling (or, more accurately, �yelping�) for help. The filmmakers cut back and forth between the pointsof- view of Horton � whose over-sized ears pick up the �microscopic� sounds of tiny voices coming from the speck � and of the airborne Who-ville, where we hear the Whos full-bodied cries of surprise. Looking to make contact with whoever is behind the tiny sounds, Horton bellows, �HELLO!� to the speck. We follow the sound wave as it travels down to the speck like a spaceship flying towards Earth. It hits the clover, passes through a blanket of clouds, and then disappears into a giant funnel, traveling through a maze of ducts � until it emerges from a drainpipe outside the Mayor�s office. As the voice makes its journey through the atmosphere, Thom modulates it in various ways, such as altering its pitch and creating what he calls a �warbling sound� � all to complement the sound-wave visual. For its journey down the drainpipe, Thom adds a bunch of �clinks� and �clanks� and other metal-stretching sounds that accompany the continuing �Hello� sound. Sound takes center stage for the film�s epic climax, in which every Who comes together, using whatever they can to make noise to make themselves heard � and save themselves from certain doom. In unison, they shout, �WE ARE HERE! WE ARE HERE!� Help comes from an unexpected source: the Mayor�s son Jo-Jo, who contributes his Symphoniphone � a wondrous musical instrument he�s rigged from non-musical objects � to the multi-layered, city-wide symphony.